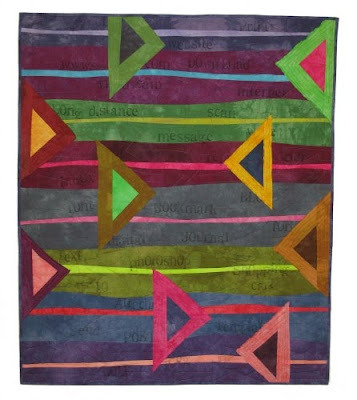 This Quilt is called Internet Connect. It is in the Connections Series of quilts and has been shown at Art Galleries in Alberta and B.C. It is 38"W X 45"H. I have hand dyed all the cotton fabric for it. After the main body was pieced I used letter blocks to stamp words about the internet. I asked the school kindergarten teacher if I could use her great old set of block stamps. I then quilted it on my long arm machine and then quilted the large triangle pieces by ruff edge applique still with the long arm.